The smartphone brand of India, called Samsung, is on song, and you got RightShopping.in to make the most of the excellence. It’s the Samsung Galaxy Y S5360 to make you smart, and you have just plenty in feature richness here to enjoy that. The Samsung Galaxy Y S5360 is a smartphone with an aesthetically pleasing design. This touchscreen bar phone runs on Android v2.3 (Gingerbread) operating system and runs on an 832 MHz processor. A large TFT screen with a resolution of 320 x 240 pixels forms the face of this mobile. The TouchWiz UI on this Samsung phone gives you a colorful user interface experience and the customizable home screens make handling and navigation convenient. A 2 megapixel camera present on the Galaxy Y from Samsung is loaded with 2x zoom. This camera also supports smile detection, white balance and panorama features that enables you to take good pictures. You can use photo effects supported on this phone to experiment with your photography. The Galaxy Y smartphone supports GPRS, EDGE, 3G and Wi-Fi platforms to connect to the Internet. You can connect to other devices through Bluetooth and a USB port and share files. The S5360 Samsung phone supports Email and Push Email along with a Document viewer that helps you keep in touch with your work environment at all times. A unique Find my phone feature makes sure that you can trace your mobile even if you lose it. You can control your phone and lock your phone or delete all the information on it altogether if you wish to. This mobile phone is preloaded with Social hub applications that integrates your mails, calendars and information in one place and keeps it updated. You can also access social networking sites like Twitter and Facebook with the Samsung Galaxy Y S5360. This phone can access the Samsung apps store and Android market to download all the applications that you need. Quicktype by SWIPE on the Galaxy Y allows you to type on this touchscreen with ease. The Samsung Galaxy Y S5360 handset from Samsung is easy to carry and use. This touchscreen phone has dedicated home, back and option keys to help you navigate the pages of your screen with ease. The left side of the phone has volume rockers that let you adjust volume levels on this device. A 3.5 mm audio jack and a USB port are situated on top while the power button is located on the right side of this Samsung phone. The Galaxy Y has an accelerometer and proximity sensor to enhance your experience. 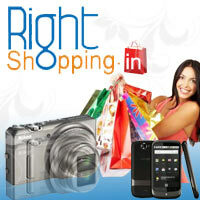 Just the visit here at www.rightshopping.in/g/p_d.asp?pid=GD100010165&item=Samsung GalaxyY S5360 Mobile Phone makes your deal. Discount can be claimed on orders from Gifts–India, Perfumes and Sari-Salwar category.